We chose the name Grief Helps because of the double meaning of these words. On this blog you’ll find a large assortment of grief helps: ideas and suggestions, words and images, mini-books and mini-videos. All of these are designed solely with grieving people in mind. And every resource offered here is absolutely free. The second meaning of Grief Helps is that grief itself does indeed help you. Grief’s purpose—it’s only purpose—is to help you heal. So grief is not something for you to run from or hide from. It’s something you will do well to approach, and to let it approach you, because that’s how you’ll find your way back to engaged living—by allowing your grief to work with you and through you as a way of helping you heal. 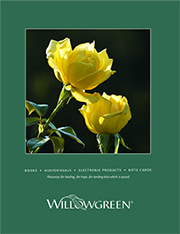 Grief Helps is the brainchild of James E. Miller, the founder of Willowgreen Inc. Willowgreen has become a leading and trusted provider of thoughtful, creative resources to assist people through life’s changing events. A focus on loss and grief has always been central. Other areas of specialization now include death and dying, illness and caregiving, the art of being a healing presence, older age, and managing transitions in general. Spirituality and inspiration are also the themes of several resources. All of Willowgreen’s offerings incorporate, to one degree or another, Jim’s writing, photography, narration, and overall design. You may email Jim using the form below. I am so thankful to hear about this blog! We lost our 21 year old son three years ago, and have been receiving 100 Healing Messages the past year. I share the messages with other grieving souls. Thank you for focusing on the bereaved with messages of hope, understanding and beauty.